Crescent Village creates a dense new neighborhood oriented around a public park in North San Jose, on the site of a former office park. Its 1,750 units of rental housing, integrated with retail and community uses are one block from light rail, with access to thousands of Silicon Valley jobs. Parking is provided in podiums, allowing welcoming, pedestrian-friendly frontages. Irvine provided land for the park as part of its development deal with the city. While the new buildings orient well to the park and interior streets, they could do more to connect to the surrounding district, including the pedestrian route to the light rail station. 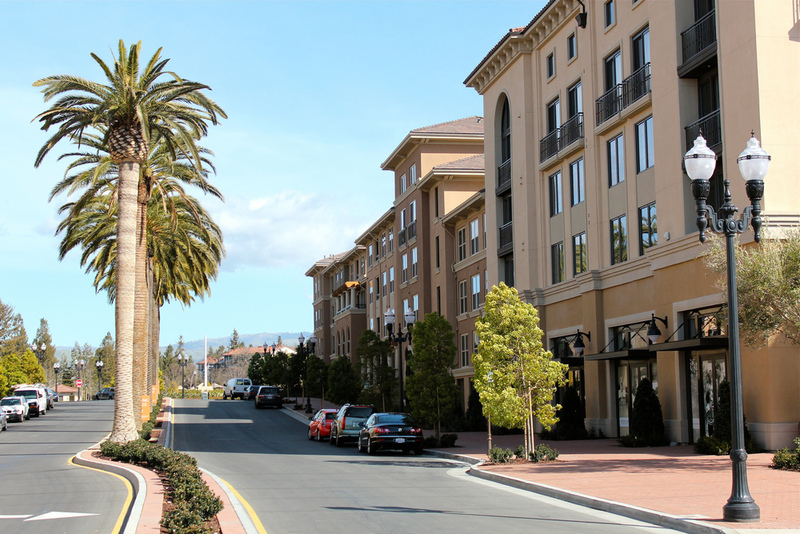 Strong housing demand coupled with the Irvine Company’s model – build, hold and manage rental housing for the long haul – creates a strong incentive to create livable, amenity-rich places. Multifamily housing is oriented to frame and activate a community park. Developers that build with the intent of holding and managing over the long haul have an incentive to invest in place making. Artful design can minimize the impact of the automobile even when parking is abundant.